Perry is inspired by the unique personality and spirit of her subjects, and she strives to convey what speaks to her, and perhaps amplify some aspect of their individuality through the medium. Rather than merely capturing a likeness with her brushes, she strives to express something ineffable in her work. The world teems with fascinating creatures we so rarely take the time to fully appreciate, given today’s nonstop pace, in which doing is valued over being. And yet we are all part of one invisible, sacred web of being. Perry’s paintings are her attempt to explore and convey facets of these worlds-within-worlds. An opening reception will be held on Thursday, October 6th, in conjunction with Amherst Arts Night Plus, from 5pm to 8pm. Perry Carter is a self-taught painter with a background in photography and interior design. 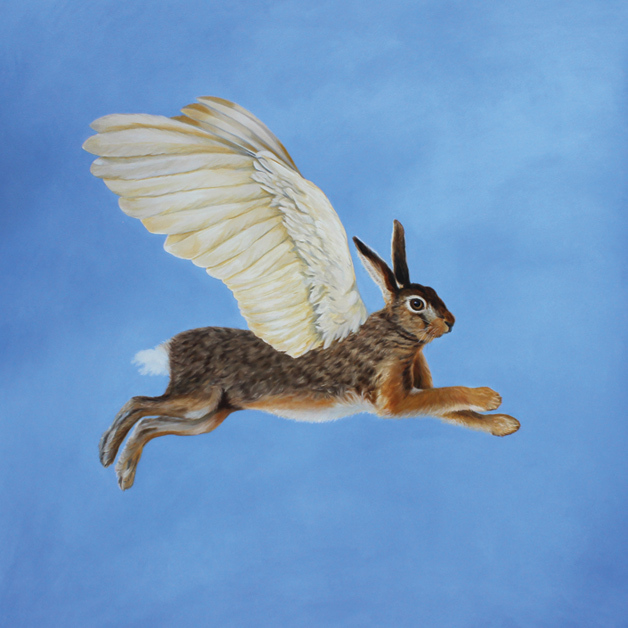 She primarily works in portraiture, inspired by Earth's many creatures. Her work has appeared in magazines, newspapers, websites, and CD artwork. She recently received a grant from The Turkeyland Cove Foundation for a painting residency on Martha’s Vineyard. In addition to her painting career, she maintains a private psychotherapy practice in Northampton, where she lives with her talented musician husband and their two kooky spaniels. 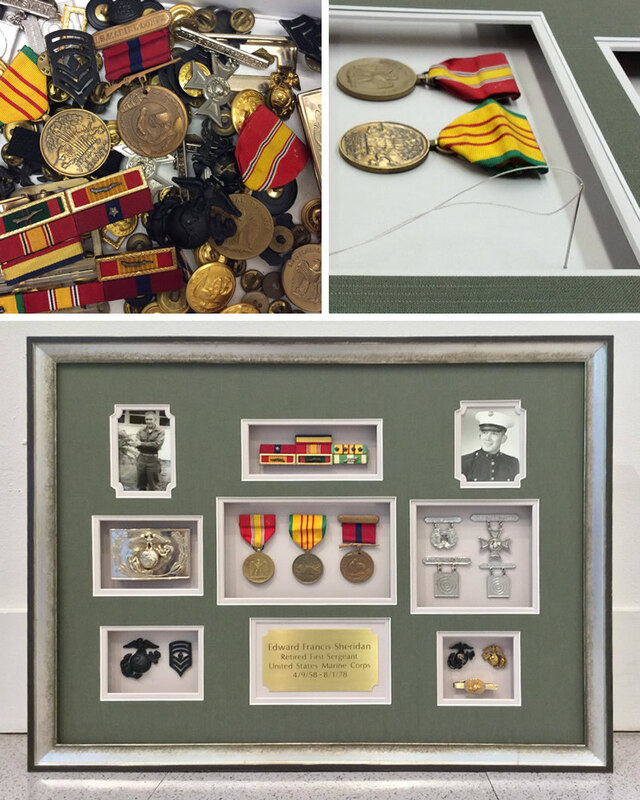 This month we had the pleasure of creating a shadowbox for a marine’s daughter who brought us a box of her father’s military memorabilia. She asked us to help her display them to honor her father’s service. After some research to identify each ribbon and medal, we carefully arranged them within a green linen mat. Each item was then attached to the mat board, most with hand stitching. We designed and ordered a classic gold plaque to commemorate the man and his medals, and finished the piece with an antiqued silver frame selected to highlight and enhance the black and white photos. Our customer was so happy with the design and execution of this piece (and we are too)! The 6th Annual Small Works Show is coming! Featuring dozens of works by local artists: from photographs to paintings, illustrations to sculptures. Submissions open October 11th! Full details & submission form on our website! Amherst Art Walk is now Amherst Arts Night Plus! Not just an art walk anymore! Look for new community-wide events coming to Arts Night Plus! Arts Night Plus includes more venues, activities, and events! Enjoy an evening that can include gallery visits plus dinner out, plus buskers on street corners, plus activities for children, plus more! 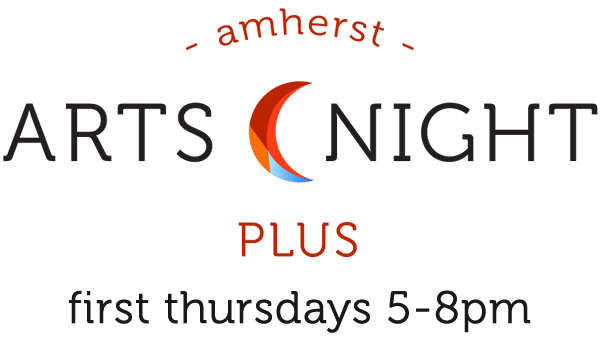 Amherst Arts Night Plus happens in and around downtown Amherst, the first Thursday of every month, from 5-8pm.